One of the little hassles when travelling is figuring out how to use your electronic devices abroad. This is particularly true today, because it has become so much easier to bring digital cameras, netbooks and cellphones on the road. 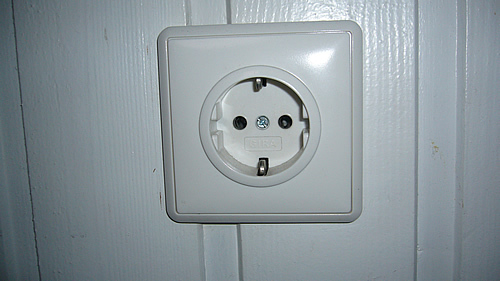 I’ve taken a few pictures of German power plugs for you, so you know what to expect when you travel to Germany. 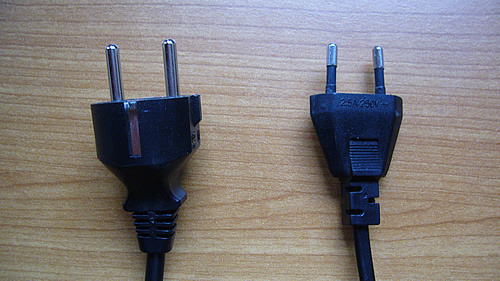 The difference between these two is simply that one is grounded/earthed (the left one), while the other (the right one) is not. They obviously both fit in the socket above, although there are smaller sockets that only allow the smaller, ungrounded, plug. Those sockets are very rare, however. 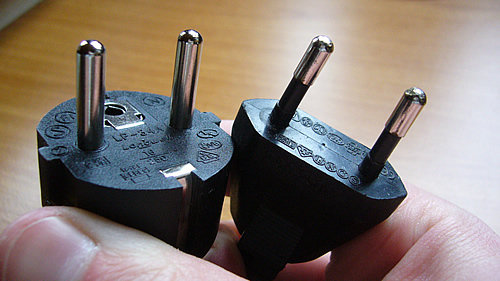 In order to use or charge your electric equipment you will need some kind of adapter that allows you to fit your electric plug into the German sockets. 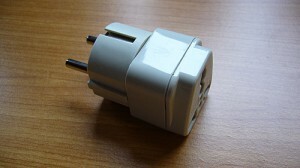 Below is an example of what one of those adapters looks like. 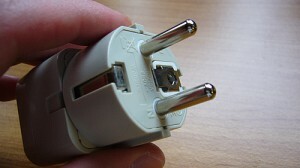 This one is to fit a US plug into a German power plug socket. These kinds of adapters come in various shapes and sizes. There are also universal ones that you can use in different countries. What you are looking for is ideally a so called Europlug (plug type CEE 7/16), because that one can be used throughout most of Europe and in many other countries. You can also find a great variety of German power plugs by simply doing an Amazon search for “power plug adapter germany”. Most of these nowadays also come with a handy USB port, so you can simply use your regular USB cable to charge your phone while abroad. 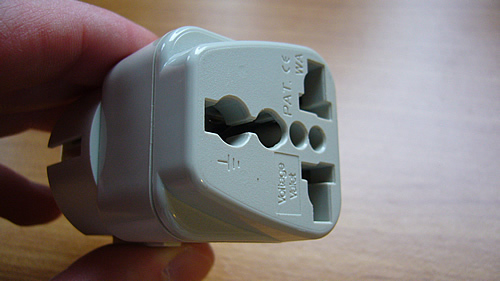 It is important to remember that these kinds of adapters do not convert or change the voltage itself! The voltage in Germany is 230V, so be sure to check if your electronic devices support this kind of AC input. If they don’t, you might cause them some damage. I am a Korean and would like to inform you that we are using German Standard wall outlet in Korea and since of it all adapters for German wall outlet fit to Korean wall outlet. Just difference is the voltage and frequency, 220V 60Hz.